The addition is clad in roof panels salvaged from the garage. Photo by Casey Dunn. The master suite features a generous site-glazed window overlooking the yard. The walk-in closet is clad in reclaimed pine shiplap. Photo by Casey Dunn. The old and new come together with attentive detailing and restraint. 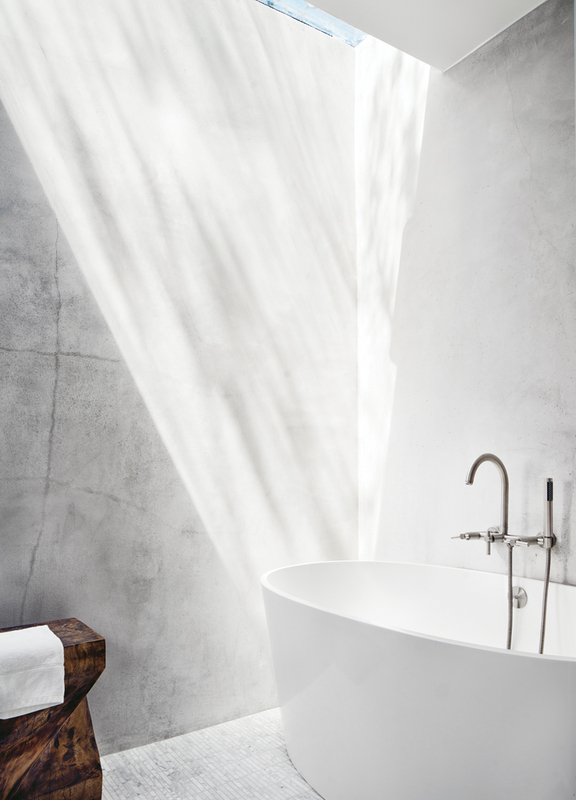 The all-white interior is accented through natural materials and the owners’ collection of objects. Photo by Casey Dunn. The master bath is finished in a simple palette of Portland cement plaster and tilework. Photo by Casey Dunn. The tent-like character of the dining room springs from the carefully considered inclined roof and its impossibly thin edge. Photo by Casey Dunn. The original straight approach and modest porch were removed and replaced with a walk that sidesteps the leaning tree. Photo by Casey Dunn. Having been through the process with Nick Deaver, AIA, before, the clients, Stephanie Archer and George Rislov, were avid architecture devotees, and they knew they could depend on his thoughtful assessment of their new property. 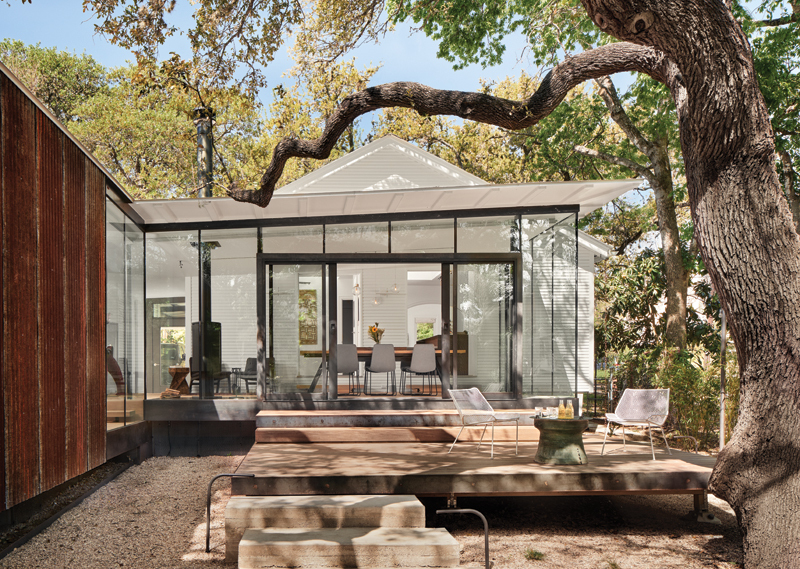 Previously, the architect designed a “down-to-the-studs” renovation for a generous house in an outlying North Austin neighborhood. As they began to understand themselves better, the clients described their first project with Deaver as “the right house in the wrong neighborhood.” They wanted to return to the core of Austin and the lifestyle it afforded — that is, a simple, curated life in a vibrant part of town. Knowing that architecture has the power to not only reflect one’s lifestyle, but to shape it, they began to work with Deaver again on their new project. The process of architecture is often a tightrope act, balancing the wants and needs of various individuals against the assets and liabilities of the project and site. 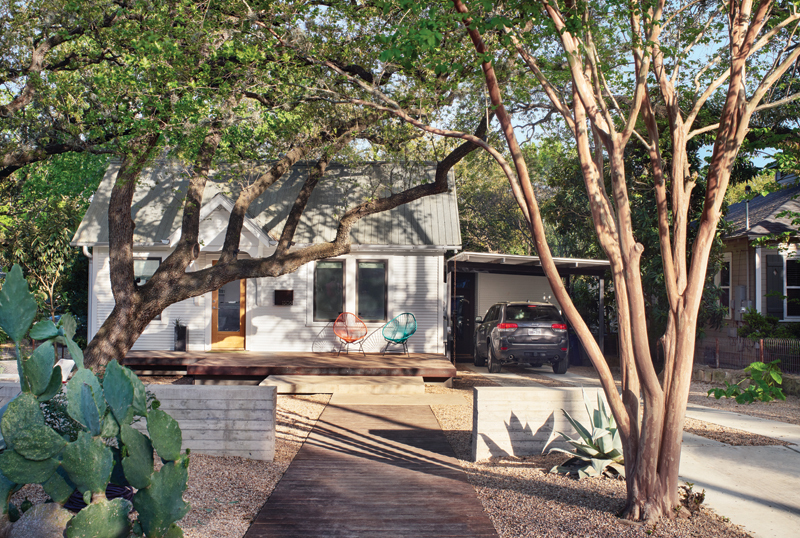 Stephanie and George found a small cottage on a quaint residential street in the historic Travis Heights neighborhood. The house was originally built and developed in 1936 by the pioneering South Austin Developer Charles Newning and is situated on his namesake avenue. By invitation of his former clients, Deaver appraised their property and discovered that it suffered a common ailment of aging real estate — a house that over time became divorced from the landscape through an irreverent sloping site and a congestion of large trees. Despite the significant cross-purposes of house and site, they also possessed latent strengths that could be tapped for the new composition. Looking to negotiate these relationships, Deaver did not so much seek out a seamless lock step between them as to bring a sense of equity and balance to the individual elements of the project. The front of the house is submissive to its original character, elemental and unspoiled by grand moves. 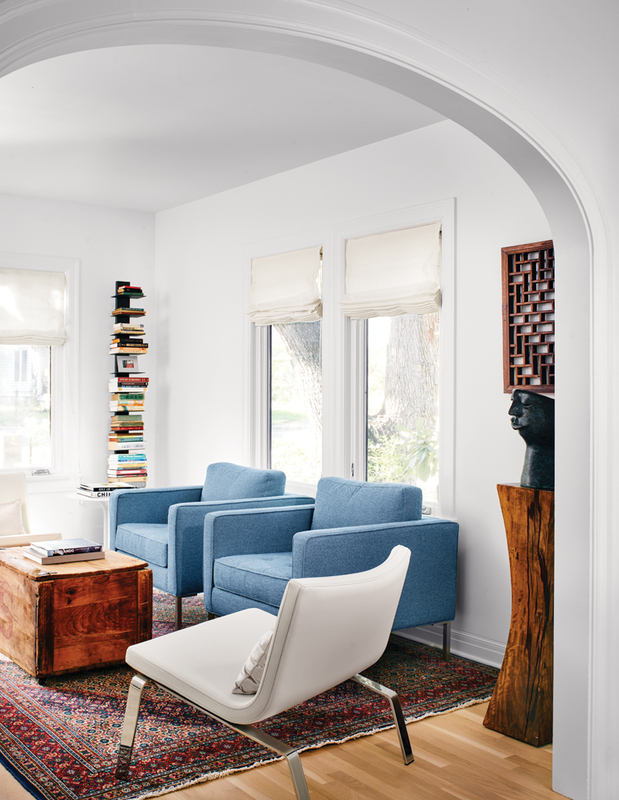 The original waterfall siding is dressed in all white and accented with dark framed casement windows. The carport, conceived as two steel wickets and a roof, pulls its simple roofline from the modern addition behind it. The design of the site and landscape is pure mediation. The walk approaching the house, offset from the axis of the door, ends with a slight dogleg so that one’s passage into the house is no longer encumbered by the tree. Working with the topography of the site, Deaver stretched out the terracing, both inside and outside, to draw out the movement over long distances. A short board-formed concrete wall, carefully considered for its casual leaning height, delineates the entry to the site in a welcoming gesture. In contrast to the front, the backyard plays an embracing role: It serves to relieve pressure from the house and enlarge its livability. The shotgun-like addition is strategically placed along the southern property edge and is the backdrop for activities in the backyard. To achieve the careful placement of the addition, however, the project would have to overcome a significant limitation. This limitation became clear as Deaver set out to understand the environmental features of the site, during his initial visit. “I am not a naturalist,” he says. “I don’t read the landscape that way, so I look to the infrastructure, and it tells me what is happening on the site.” As he describes this process, he points out that the site sits at a low point, relative to the land that surrounds it. The street slowly climbs up as it stretches further away in either direction. At this lowest spot, near the northwest corner of the property line, sits the mouth of a large stormwater inlet, where it joins a large underground pipe that then runs diagonally under the site, discharging to a natural creek behind. The resulting municipal easement above this inlet carved away at the buildable area of the site and inflicted a major hindrance on development of a backyard addition. In a moment of creativity, Deaver began “horse-trading” with the City of Austin. Austin’s notorious protection of trees, up against the fact of a prominent live oak tree smack in the middle of the existing easement, gave him his argument: trade the air rights in the current easement for rights to a future easement when the storm pipe needs replacing. This makes the project possible while guaranteeing a long life for the cherished tree. Intertwined with the exterior, the interior awakens the senses; one can’t be in the house without knowing what kind of day it is. 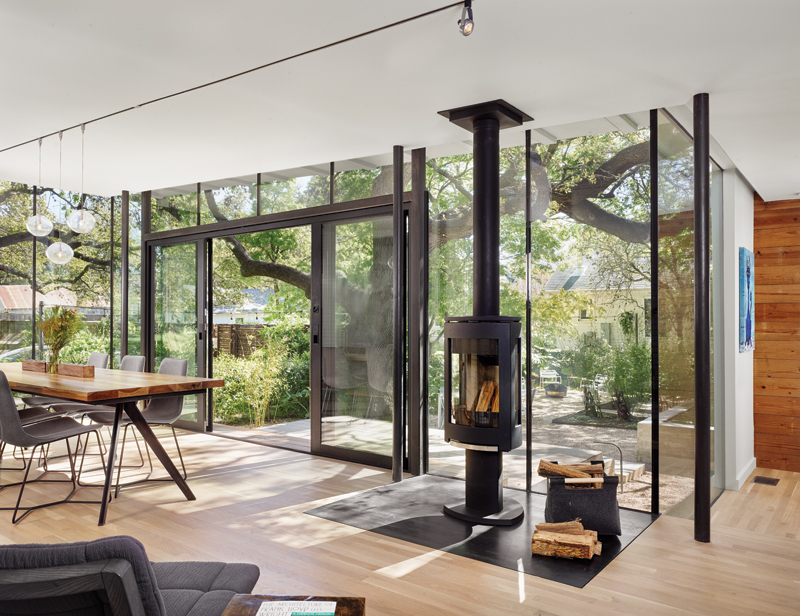 The living spaces at the existing house are contained and elicit purposeful repose. 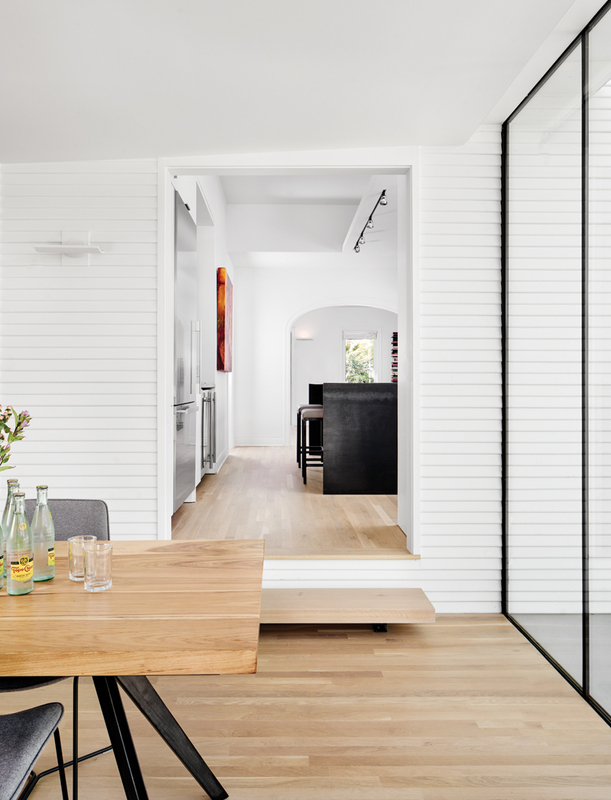 They allow for moments of settlement before moving into the kitchen, where modern touches start weaving into the existing house. Finding places to display objects around and within the utility of rooms, Deaver emphasizes the importance of this effort to the project: “Where art belongs, life belongs.” The clients’ various paintings and collections are highlighted against the restrained white walls. The dining room is the soul of the house, neatly tucked against the existing house and sheathed in frameless glazing. 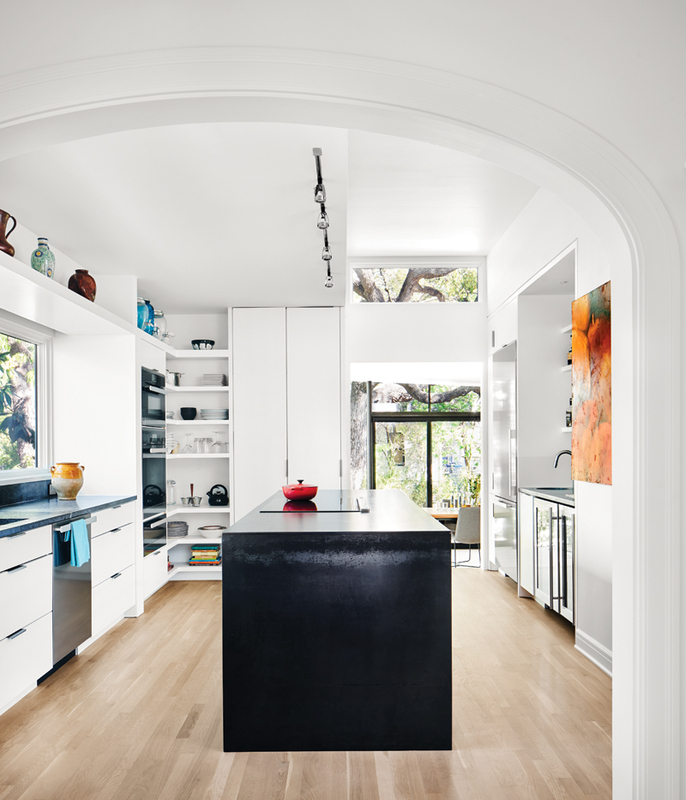 The surrounding landscape directly engages the edges of the room like a full-bleed image. It is a counterweight to the other living spaces that are about looking within and being embraced. Large double sliders connect to the outdoor living at the backyard as the master addition stretches off to the side. Stepping down into the recumbent addition of the master suite is a reminder that this is backstage of the house. 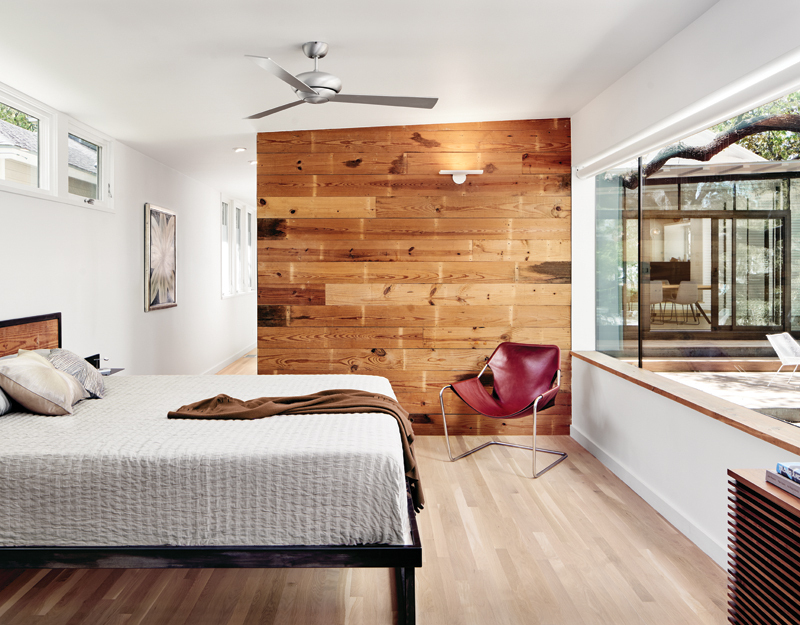 The large master closet is clad in old-growth pine shiplap reclaimed from the demolition work in the original house. It serves as a buffer between the bedroom and the living spaces and forces one to move around it in an intentional manner — an appropriate device that speaks to the private character of the master suite. Borrowing a term from F1 racing, Deaver describes this element as a “chicane” — an artificial obstacle that is strategically placed to slow traffic down. The master bath is placed at one end of the master suite. The generosity of daylight and soft materials betray its compact size and efficiency. The form that would give shape to the addition stands on its own as a modern expression. Deaver, however, was not simply seeking a generic modern addition. He was not looking for a piece that could be simply attached to any house; rather, he was looking for a companion shape. “Like dance partners, there is a trusting of the two together,” he states. “They are a couple.” On that delicate footing, the addition not only belongs distinctly to that house and that site, but also fosters a relationship of equity between the old and new. It is sensitive without being compromising; it is individualistic without being domineering. Stephanie and George knew Deaver was not a “grand schemer,” but rather an architect who relies on small, powerful moves. Explaining the ultimate balancing act of it all, Deaver says: “The clients want a house, but what I want is architecture. They want familiarity and comfort, but for me — I want exploration, a sense of newness.” Deaver artfully finds that center of mass through careful deliberation and evenhandedness, and with a deep respect for all that is there. 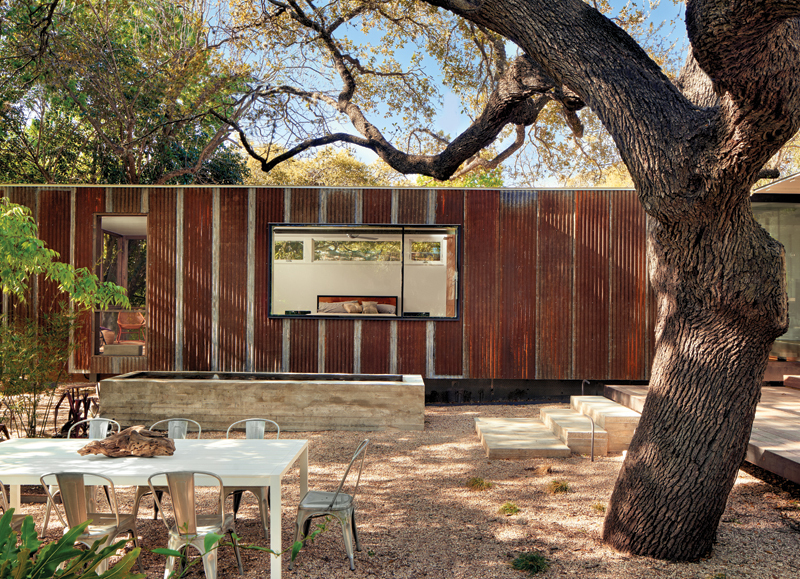 Chris Cobb, AIA, is an architect in Austin.